Range: They are primarily found along the Indus River of Pakistan and North India, and the Ganges River of India, Nepal, and Bangladesh. Habitat: Streams, meadows, bogs, and ponds. Their hibernation seasons are unknown due to the fact that the climates of their different locations vary a great deal.However their courtship months are said to be during February and March, and their nesting seasons are during April and May.This particular type of turtle grows to its adult size at approximately 14 inches.They spend most of their days basking in the sun to rid their shells of algae and parasites.When night falls they submerge below the surface of the water to sleep. 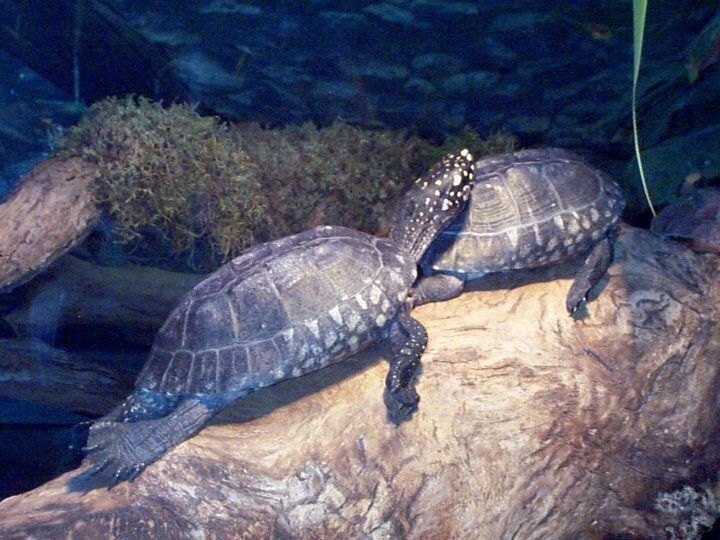 Female Spotted Turtles are able to store sperm and use it as many as five years later to produce healthy eggs.This aids the Spotted Turtles when the population is inadequate or the conditions are unsuitable for breeding. 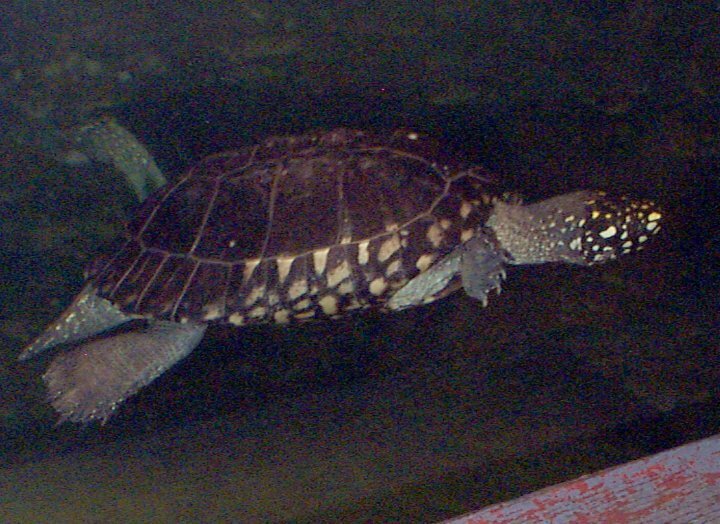 This particular group of Spotted Turtles was obtained from the Lowry Park Zoo.Geoclemmys hamiltonii are particularly rare due to the extreme demand for them on the Asian food market. They are listed as CITES (Convention on International Trade of Endangered Species) Appendix 1, which is the highest priority.G.hamiltoniiare also covered under the Endangered Species Act. This means that the species runs a serious risk of becoming extinct in the wild. The Fort Worth Zoo participates with many privately funded organizations along with government groups that try to educate the public along with provide a safe haven for this rare species. When I observed the Spotted Turtles I could not help but notice how playful they were.They would swim up to the glass as if to get a better observation of their visitors.If they were not attempting to get a better view of the zoo attendees they were basking in the warmth of the heat lamp. Pritchard, Peter H. Encyclopedia of Turtles. Pg. 218-219. Barbour, Roger W., and Ernst, Carl H. Turtles of the World. Pgs. 136-137 and 154. King, Wayne F., Crocodilian, Tuatara, and Turtle Species of the World: A Taxonomicand Geographic Reference. pgs 35-36.